How do you like your Butterbeer? If you’re a little picky about the way you like to drink…or eat your Butterbeer, Universal Orlando now has six different ways to take the tasty sweet treat. In addition, Diagon Alley has an all new candy shop and it’s brimming with tasty new treats and favorites…but it’s all about that Butterbeer! The all new shop is directly on the corner where Shutterbuttons used to be. That shop has been moved to the space where Eyelops Owl Emporium once was. The Owl Emporium was a place with some animatronic owls, and was meant to be a queue for Madame Malkins. However, that shop is either not as popular as once hoped, or the shop is spacious enough to accommodate everyone, so the extra space wasn’t needed. Shutterbuttons was a fun premise, as you get your “moving pictures” done in the Wizarding World. While it’s a popular option now, the location before was out of the way and it went overlooked. Plus, the line for the small shop was always out the door, and a bit of a turn off. Now, everything works out better, and guests get a much needed (well, that’s debatable) Sweet Shop. The location for the shop is perfect, as it ties directly into another shop, and gets tons of traffic browsing through. 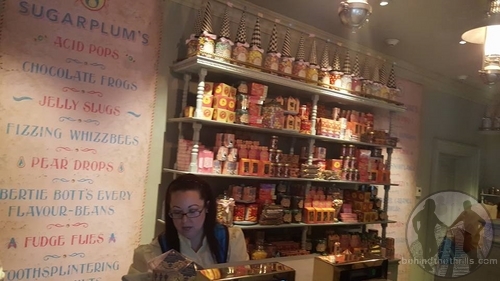 While the products don’t differ much from Honeydukes in Hogsmeade, it is a tad different, and offers yet another great place to get some fun products. Of course there’s Chocolate Frogs, and Bertie Bott’s Every Flavor Beans, Fudge Flies, Pepper Imps and more. 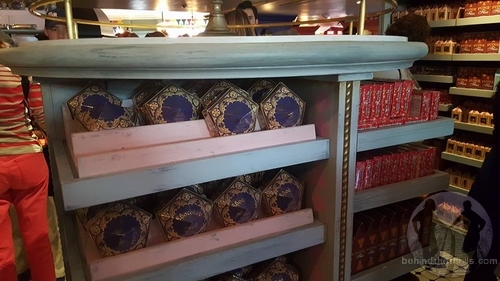 There’s also a great confection counter that gives you the chance to get the newest addition to the Butterbeer family, Fudge…but more on that later. 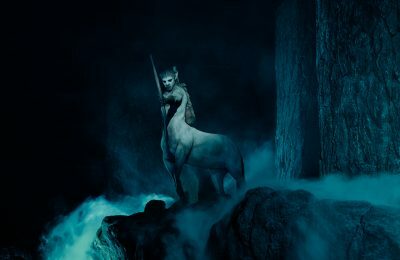 Now, the newest addition to the Butterbeer family isn’t exactly exclusive to Sugarplums, but it is relatively new. 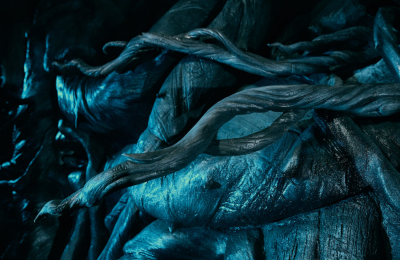 It brings the count of Butterbeer to a whopping six different types…more or less. 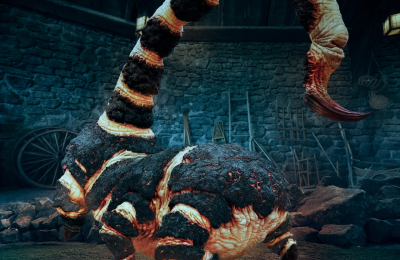 Three drinkable types, and three edible types of Butterbeer now grace the Wizarding World. There’s regular, frozen and hot Butterbeer. Butterbeer Ice Cream, Butterbeer Pudding (technically it’s called Potted cream, but everyone in the Wizarding World referred to it as Butterbeer Pudding) and now Butterbeer Fudge. The Fudge is extremely sweet, but very tasty. It has that creamy fudge taste, and also that unmistakable Butterbeer flavor of butterscotch, vanilla and every other addicting thing out there. 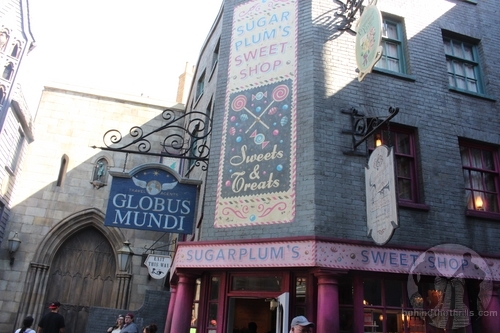 You can get the fudge at both Sugarplums, and Honeydukes. The Potted Cream is at Leaky Cauldron, and the ice cream is in the ice cream shop in Diagon Alley. The Butterbeer Fudge isn’t the only new item, or at least new to us. There’s also Pumpkin Cakes. 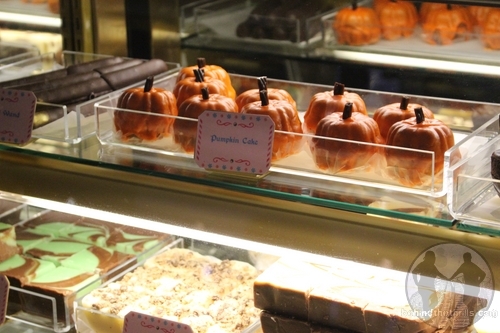 They are perfectly formed pumpkins, coated with a thick frosting and very spongy cake. 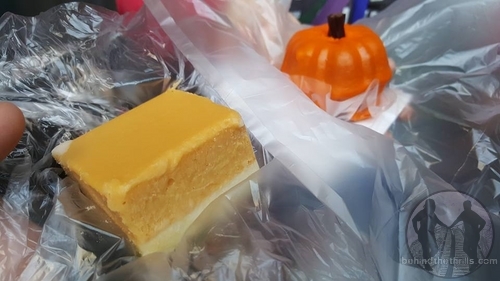 The cake doesn’t taste like pumpkin, but has a very cinnamonny-citrus flavor. In short, delicious.